Clarksville Academy encourages students to participate in extracurricular activities such as clubs and athletics. CA offers a wide variety of clubs and service organizations. Over 92% of our children participate in community service. We help not only locally but all across the globe. Many Clarksville Academy clubs and organizations perform community service on a regular basis. This includes both Intermediate School and Upper School. In 2012 CA added Challenged Based Learning, which takes an overriding topic and allows the students to collaborate and create projects and solutions that will be beneficial to themselves and the community. This project focuses on our Upper School, but will also include some activities for Intermediate & Lower School. Over 85% of our upper school students participate in one or more sport. Extracurricular activities encourage time management and foster relationships with fellow students and the Clarksville community. Archery Club is open to CA students from 9th to 12th grade. The entry fee is $40 and is paid yearly. All experience levels and styles are welcome. Beginner Lessons are available on request. Both traditional bows and compound bows are used. The Archery club meets behind the football field at the CA sports complex one day a week in the Fall and Spring. Builder’s Club is a community service organization that encourages students in 6th-8th grade to give back. Students will build camaraderie and pride within themselves as they help others. Hours are recorded and turned into the Presidential Volunteer Service Award Organization at the end of their 8th grade year. Students that receive over 50 total hours in one school year receive a reward. Builder’s Club is a subsidiary of Key Club and the Kiwanis Club. Chess Club is open to Intermediate & Upper school Students who play chess or are interested in learning to play chess. All skill levels are welcome. Chess Club meets weekly for one hour on Friday afternoons after school. Membership is open, which means weekly participation is not mandatory, and is thus accommodating to a student’s busy schedule. Concert Choir is a class that takes place Semester I of each school year. In Concert Choir, fundamentals of singing are taught and built upon. The group learns and performs music for Veteran’s Day and a variety of Christmas performances. The Christmas performances include the Courthouse Christmas Tree Lighting, Spiritfest held in downtown Clarksville before the Christmas Parade, the Clarksville Academy Christmas Concert, and Disney World. Show Choir is a class that takes place Semester II of each school year. In Show Choir, dancing and acting is added to singing. The Annual Evening With Friends is the main performance of the semester. The group also sings for graduation. Many members of the group choose to remain in the choir for all four years of upper school. There are some members who begin with Intermediate Choir and remain in choir for seven years. The Concert Choir is offered before school to all students in grades third through fifth who are interested in expanding their musical talent. Students practice twice weekly on Tuesday and Thursday prior to the school day. Students perform in a variety of shows including, but not limited to: Veteran’s Day, Annual Christmas Tree Lighting at the Courthouse, Annual Christmas Program, and Steak Dinner. 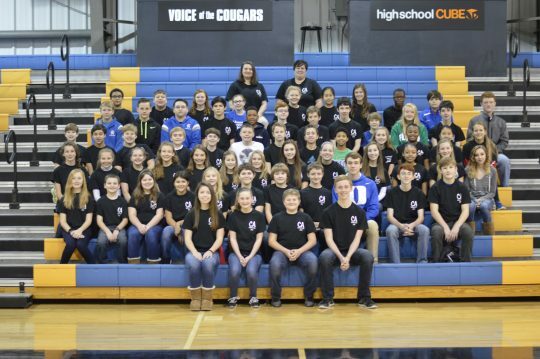 There is no fee for Cougar Choir, but students are required to purchase a performance shirt. Anyone in grades 6-8 may attend. FCA meets before school every Wednesday in Coach Trent’s room. Club Huddle Campus Groups are certified ministries, which are initiated and led by student-athletes, sponsored by coaches, supported by staff, and meet on a weekly basis. Both Intermediate and Upper School Huddle Groups are open to everyone, not just student-athletes. FCA VALUES: Our relationships will demonstrate steadfast commitment to Jesus Christ and His Word through Integrity, Serving, Teamwork and Excellence. There is no fee to participate in FCA. Students in grades 9-12 may attend FCA and these meetings are not limited to student athletes. Club Huddle Campus Groups are certified ministries, which are initiated and led by student-athletes, sponsored by coaches, supported by staff, and meet on a weekly basis. Intermediate and Upper School Huddle Groups are open to everyone, not just student-athletes. FCA focuses on various service projects throughout the year such as taking cards and fruit baskets to local Nursing Homes, adopting several Angel Tree families and supplying them with needed items for the holidays, sponsoring at least one cleft surgery through the Smile Train, donating food, personal items and more to the Salvation Army, sending care packages to various soldiers, and sending bios and, water filters, chickens, goats, bibles and more to Asia. We also pray weekly for student prayer request which include community and national people and events. Each year we grant a $1000.00 FCA scholarship in memory of Wesley. 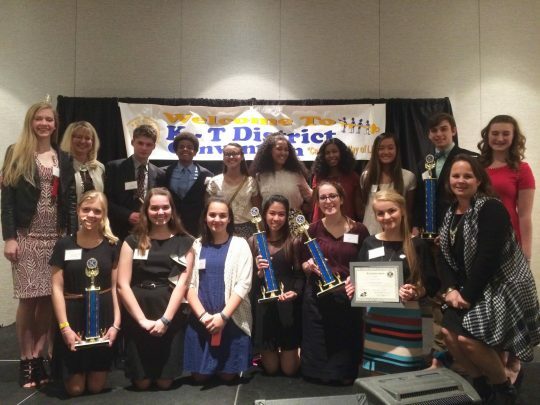 The Upper School Cougar Forensics Team is a competitive speech and debate team. The team travels throughout the state of Tennessee and the nation to compete in tournaments in individual and partner debate events and individual speech events. Students have the option of two debate events and thirteen speech events in which they pick the one that best suits their personal styles, talents, and interests. Students learn argumentation, research, writing, and public speaking skills in a fun and competitive environment. The club is open to all Upper School students. The Forensics team is coached by Upper School English teacher, Mrs. Bridget Baron, and her husband, Dr. Rob Baron, professor of Communication at Austin Peay State University. Practices are held on Monday and Wednesday afternoons after school and the Team competes on various Saturdays from September through April. Girls on the Run is an after-school activity that inspires girls to be joyful, healthy and confident using an exciting, experience-based curriculum which creatively integrates running. We can have up to 12 girls per Huddle in grades 3rd-5th. We meet twice a week for an entire semester. At the end of the semester, the girls will be trained to complete a 5k (3.1 miles)! Each Huddle, we bring a core value to life and center our daily focus around that core value….all while running and participating in fun games. Girls On The Run envisions a world where every girl knows and activates her limitless potential and is free to boldly pursue her dreams. The Interact Club is a high school branch of Rotary Club International. Interact Club is open to any community service minded student in grades 9-12. The students work with the Clarksville Sunrise Rotary Club at their events and also assist at Manna Café. The club has 4 community service events per semester and the annual club dues are $10. All students in Latin at CA are required to join the Junior Classical League. The Junior Classical League, or JCL, is a national organization sponsored by the American Classical League and dedicated to encouraging student interest in the language, literature, and culture of ancient Greece and Rome and to bestow an insight of what our own culture owes to Classical antiquity. At the school level, the organization is working to become more active in the community. At the local level, the students are invited every year to compete with other students in the area. Key Club is the oldest and largest service program for high school students. It is a student-led organization that teaches leadership through service to others. Members of the Kiwanis International family, Key Club members build themselves as they build their schools and communities. Examples of previous years activities by the Clarksville Academy Chapter included collecting soft drink tabs and laundry detergent to benefit the Ronald McDonald House in Nashville, donated Jeans for Teens to benefit local needy children, food collection of the FUEL program, bringing art supplies to local hospitalized children, volunteering at all school sports games, Angel Tree adoption through the Salvation Army, volunteering at Rivers & Spires and Riverfest and collecting items for Operation Homefront. Members are required to earn 40 service hours a year. Model UN is a fall semester high school program sponsored by the YMCA of Tennessee. Students learn about how international politics work. The program culminates in a three-day state conference held in Murfreesboro, TN during the month of November. NJHS recognizes student academic achievement and interacts with the community through required service hours and projects. Students are invited to join NJHS in their eighth grade year after receiving a 3.0 GPA or higher. Membership in National Honor Society is by invitation, based on the 5 traits held in high esteem by the society. These traits are scholarship, character, leadership, citizenship and service. Each member is required to maintain a 3.0 GPA, attend meetings, pay dues and complete 5 hours of community service each school year. For the fall semester, members are juniors and seniors. In February, all sophomores and juniors/seniors (who are not members) are considered for membership by the faculty council. Those being considered must have a 3.0 GPA, meet all traits of the society and have been enrolled at CA for at least one year. Approximately 75% of our students are involved the full three years. Student Council members are elected yearly by the student body 6th-12th grade. The three officers from each class and four slate officers serve the student body in many ways, from leading the charge on planning and implementing events such as homecoming and field day to reporting to the sponsors with questions, concerns, and ideas from their peers. There is no community service element to SC, but members have mandatory monthly meetings. Youth In Government takes place in the spring semester and is the YMCA companion program to the Model UN. 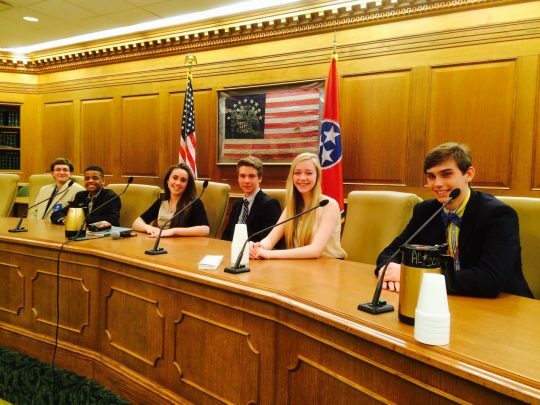 In this program high school students learn about how politics work at the state level. This program culminates in a four-day conference held in the state capitol facilities in Nashville.